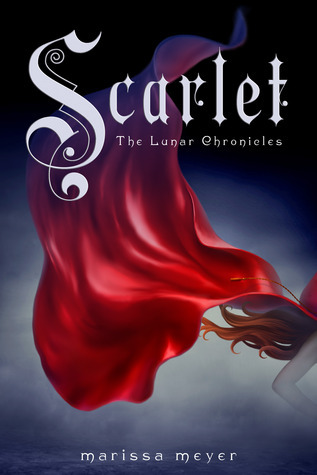 Before I read Scarlet, I read back over my review of Cinder- curious because it has been quite awhile since I have read it. I am happy to say that all of the issues I had with the first book are non-exsistant in this book. I was absolutely swept away by this story! To be honest, I was a little surprised by the choice of "fairy tale" that the author used in her second book. I expected book two to be solely about Cinder- boy was I wrong. The narrative flipped back and forth between Cinder and Scarlet, but the majority of the story really focused on Scarlet (at least it seemed that way). It wasn't an issue, but I was confused at the beginning. Cinder is set up as a fantasy science fiction book and I just couldn't see how wolves could fit into that world without seeming absolutely ridiculous. Boy was I wrong! I loved all of the scenes with the wolves the most- the way the author created the story behind this army of wolves was fantastic! I don't really want to go into great detail but the time between Scarlet and Wolf really was the shining storyline in this book. Wolf was a hero that I wanted to get to know more. He really is more engaging and desirable to me than Prince Kai. The Lunar Queen is still an excellent villain. We really dig deeper in this book about the Lunar society and how truly frightening they can be to Earth. The Lunar Queen is not a villain you want to love and she has no redeemable qualities- exactly how she should be. I would love to know how inspired by Sailor Moon this author was- there are so many similarities! The Moonie in me really wants this book to be inspired by Sailor Moon- it is a fan girl's dream! I can't wait for the third book in this series- it has become one of my favorite fairy tale adaptations in a series! Everything I've read about this book has made me WANT TO READ IT NOW! LIke you, I enjoyed Cinder, but I also had some issues with it, and couldn't fathom how the author could continue Cinder's story, while moving onto a new fairytale. But it seems like she does it perfectly! I have a copy staring at me and plan to get to it asap!